I have a logo picture and a text in a svg file. Both of them are black. I want to make an image where the original image and text are transparent, but their drop-shadow is visible. How can I do that? Something like this image (the white area should be transparent, only the shadow is visible). 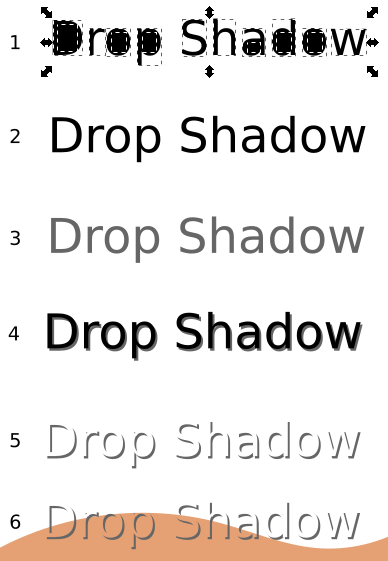 Moreover, I want to use the drop-shadow function of Inkscape, not a duplication/offset method (because I need blurred shadow). Create some text. Convert to outlines using Path > Object to Path, click Object > Ungroup, then Path > Break Apart, then turn into a compound path using Path > Combine. Duplicate the text, so you have a copy. Fill one copy of the text grey. Bring the black copy to the top using Object > Raise to Top. Move it to partially overlap the black text over the grey. Select both black and grey objects, and click Path > Difference. Position the graphic over a filled shape to see the transparency. Export the resulting graphic as a PNG. A transparent shape can't cover anything. What you can do, is subtract a copy of a shape from itself. You start by a path, so make your text and logo (only works if they are of the same color or will force them to be of same color) a combined path. (Transform text to path, combine text-path and logo-path - Ctrl-K in the german GUI). build the difference with (ctrl -). The upper object in Z-axis will always be subtracted from the lower one. For finer navigation, you might change the color of the duplicate. For even finer positioning, making it semi transparent might help. Here I duplicated shape and text (black), made the duplicate the same color as the bg (white) and moved that to a little offset (sample left). Font and shape are of the same color (black), so they can be combined to one path. Duplicating the path, moving it in the same way with a little offset but then making the difference between black and white shape (sample right). The red rectangle in the background is there, to make the difference visible. Not the answer you're looking for? Browse other questions tagged inkscape drop-shadow or ask your own question. In Inkscape, how to create a gradient between color A and color B instead of color A and transparent?